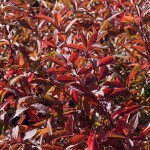 This is a rounded, arching shrub with dark green glossy foliage that turns brilliant scarlet in fall. 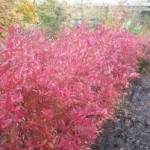 The foliage holds on late into the fall for a long display of color. 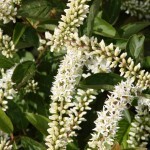 Summer flowers are white, fragrant, and held in 6" long racemes. 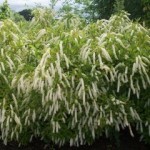 Wonderful planted as a specimen or in groups or as a lax hedge. The species is found in the southeastern United States along wooded stream banks, swampy borders and wet woodlands. It prefers some sun, but will tolerate partial shade. 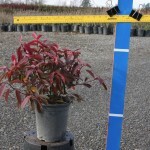 This is a very adaptable plant.